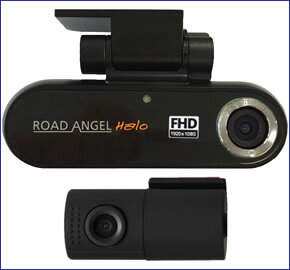 Road Angel Halo HD accident camera provides both front and rear cameras, plus it has built-in GPS that will work with Google Maps on your computer as well as offer playback of video on your Windows PC. Both the Halo's front and rear cameras records in High Definition at 1920p x 1080p. It is the only in-car camera to record with a viewing angle of 150 degrees offering a wide view of the road ahead and behind. There are four recording modes including continuous recording, manual recording, impact detection mode and parked mode. You get a 16GB microSD card with the Road Angel Halo HD and you can upgrade to a 32GB microSD card if you would like to. All video is recorded in .AVI format. A windscreen mount is included with your purchase of the Road Angel Halo HD and there is an optional hardwire kit available. Road Angel Halo HD is no longer stock by ActiveGPS. There are four modes for recording events in the road when driving and when parked. When driving the Halo in car camera can be set to record continuously in real time to record every possible event that may occur. Secondly, there is an event mode that will start recording when events occur using the G-Sensor built-in to the Road Angel Halo HD (when impact is detected). Thirdly the manual mode allows you to start recording at the push of a button putting you in control of what is recorded. Finally, there is Parked mode which works when the vehicles ignition is turned off. Whenever motion/movement is detected by either the front or rear cameras the Halo will start recording video saving potential video evidence of an incident to the device memory. The Road Angel Halo HD includes a 16GB microSD card for storing video on. This memory can be increased to a 32GB microSD at maximum capacity. There is also a microphone on the Halo for recording sound inside the vehicle. If the need arises when an incident occurs, you could remove the Halo from the windscreen mount and record video and sound outside your vehicle too. The microphone can be set to silent mode giving you privacy when driving in your car. The Road Angel Halo HD has built-in GPS technology which will work with Google Maps. You can also view your video footage back on your computer to review incidents or use as evidence for insurance purposes. All video is recorded in .AVI format. Do you have a question about the Road Angel Halo HD that's not been answered on this webpage? Please see our Dash Cam FAQ's for questions from other people. If the answer to your question isn't featured, use the online form to ask us for the answer. Alternatively please telephone 01733 777623 Monday to Friday (9:30am-5:00pm) to speak to one of our sales team. The Road Angel Halo HD should be mounted on the vehicles windscreen using the supplied windscreen mount. You can optionally hardwire the Halo into your car and this hardwire kit is available separately. The Road Angel Halo HD is supported for use on Windows 7, Windows 8 and Windows 8.1. The Road Angel Halo HD is not compatible with Apple Macintosh or Linux operating systems. The Road Angel Halo HD comes complete with everything you need to get it up and running straight from the box. However, there are a number of accessories and spares that are available. These include the Halo hardwire power cable, cable clips and additional 16GB microSD card to record more of your journeys. Question: I have a van with no windows can the rear camera be fitted outside on the halo? Answer: Neither of the Road Angel Halo cameras are waterproof, in addition there is no mount available to attach the Halo's camera to the outside of the vehicle. Do you have a question about the Road Angel Halo HD? Submit your question via our contact page. ‣Angle of view: Front camera 150 degree viewing angle.